Great weather for a great cause brought together a crowd of almost 400 men, women, and children for the second annual Sunset Stroll, Sept. 28 at Overbrook. 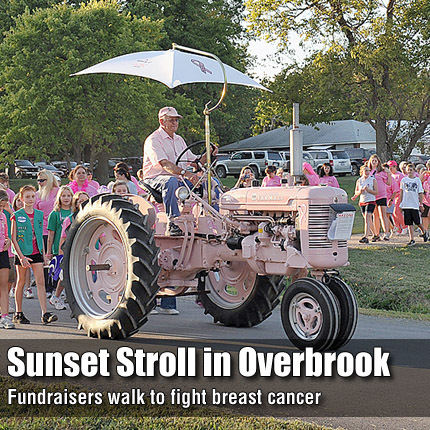 The event raised funds for The Race Against Breast Cancer, an organization that provides low and no cost mammograms to women in Osage and other area counties. Prior to the stroll, attendees shopped at various vendor booths. Free chair massages and free photo booth pictures were available. Santa Fe Trail High School Future Business Leaders of America provided a children’s corner with a variety of games and prizes. The first 250 participants registered received a goodie bag with gifts and coupons from many local merchants. A raffle was available with over 30 items to bid on, including items from Kansas State University, University of Kansas, Kansas City Royals, Kansas City Chiefs, Kansas City T-Bones, and Schlitterbahn Water Park. The 2011 balloon launch was named “The Shirley Lang Memorial Balloon Launch” in honor of a local resident who lost her life to breast cancer earlier this year. Her daughters addressed the crowd thanking them for participating in the event. The crowd heard from Leslie Wurdeman Riner who encouraged women to be vigilant about breast cancer exams and regular mammograms. The crowd released pink balloons in honor of or in memory of someone who has dealt with breast cancer. Following the balloon launch, Harold Denholm, Tonganoxie, led the stroll. Denholm brought “Mom’s Tractor” which is a 1951 “Super C” tractor, restored and painted pink in honor of Denholm’s late wife, Aileen, who died of breast cancer in 2007. The large crowd, led by local Girl Scouts and 4H members, strolled away from the fairgrounds and around Overbrook Lake. While the final amount raised is not available at this time, it is anticipated that the amount raised at this year’s event will exceed the amount raised in 2010, which was $1,860.